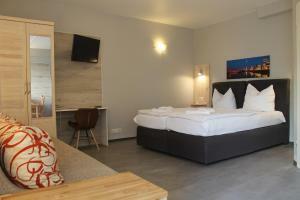 This hotel in the heart of Düsseldorf offers secure underground parking and spacious rooms with free Wi-Fi. It is a 3-minute tram ride from the Königsallee shopping street and Düsseldorf Central Station. 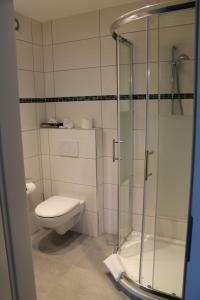 A work desk, TV and private bathroom are provided at the City Lounge Hotel. Rooms are individually furnished and feature modern artwork on the walls. Guests can wake up to a large breakfast buffet at the City Lounge Hotel. This can be enjoyed in the cosy breakfast room or outside on the pretty courtyard terrace. Helmholtzstraße Tram Stop is just a 2-minute walk away. Due to the fact that the hotel is surrounded by many apartments, guests are asked not to make excessive noise in the evenings. No parties are allowed at the premises. Guests should please note that for credit card, maestro and debit card payments, both the card and the holder's identity card or passport should be presented as well. The credit card holder must be present upon arrival and sign the credit card slip in person, otherwise guests have to pay in cash, maestro or by debit card. Please note that the check-in and key-collection take place at: Herzogstr. 93, 40215 Düsseldorf. Guests are required to show a photo identification and credit card upon check-in. Please note that all Special Requests are subject to availability and additional charges may apply. Please inform City Lounge Hotel in advance of your expected arrival time. You can use the Special Requests box when booking, or contact the property directly with the contact details provided in your confirmation. Payment before arrival via bank transfer is required. The property will contact you after you book to provide instructions.